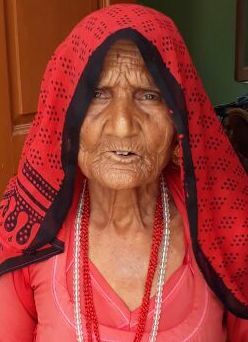 Aasi Devi is an 80-year-old resident of Baytu Bhopji in Asalaram village in Rajasthan where she had been living a life devoid of any government assistance. An ageing woman, she was not enrolled under any government scheme or entitlement as she was unaware about even the most popular pension schemes. Nor did she know who to approach for help until a Soochna Seva team visited Baytu Bhopji. The team shared ample information about various schemes with community members and encouraged Aasi Devi to apply for an old age pension scheme under which she would receive Rs. 750 per month. The team even assisted her to submit an application and reach out to the Sarpanch Block Development Officer to clear all formalities. In less than two weeks, her name was added to the list of pension beneficiaries and her bank account opened. She now receives regular monthly pension.